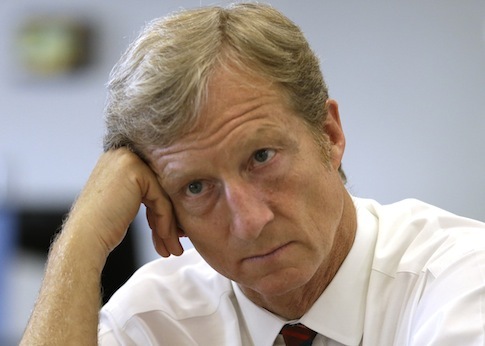 Dear Tom Steyer, Can You Not? I see your billion-dollar ads for impeachment, and I’m intrigued. What’s your motive? I know that you’re a smart business man and an environmental activist. Sure, there are other billionaires whose motives range from pure to illumanatic. And avoiding the George Soros conspiracy theories, you’ve taken a front-facing approach with a crystal-clear motive – impeachment. But why? Look, I know the only thing I have that could match your financial prowess is my ambition. And that doesn’t warrant my financial advisement. However, there has to be a way for you to spend YOUR money more wisely. I mean, really. There are some steep steps to reaching the final destination of impeachment. I’m sure you are aware of that. Based on my research, you are a real billionaire, which means you are really smart. Yet, it makes me question. What is your real motive here? Is this some kind of presidential campaign? Promising people impeachment through a “petition” is a great tool for exciting emotional snowflakes that thrive off of hysteria the liberal base. But is it productive? You can pay off my student loans. That’s what you can do. While you’re at it, put me on an equitable financial footing – pay off my debt. Buy me a matte black Camaro. It would be quite selfish of you to pay off my debt and not reward me for doing such. Bring back UPN’s Girlfriends for one final season. Like, I really need closure. Buy me a nice outfit for the Black Panther. Wouldn’t it be awesome for me to roll up to the theater debt-free-and-all, in my matte black Camaro, in some nice new threads. Or you could just be strategic and invest your money into something with higher returns like lawyering up and hiring people to make sure the 2020 census is conducted fairly, fighting gerrymandering by supporting candidates that’ll push for independent redistricting committees, or like conducting mass voter registration drives. But hey, I’ll take the matte black Camaro instead any day.